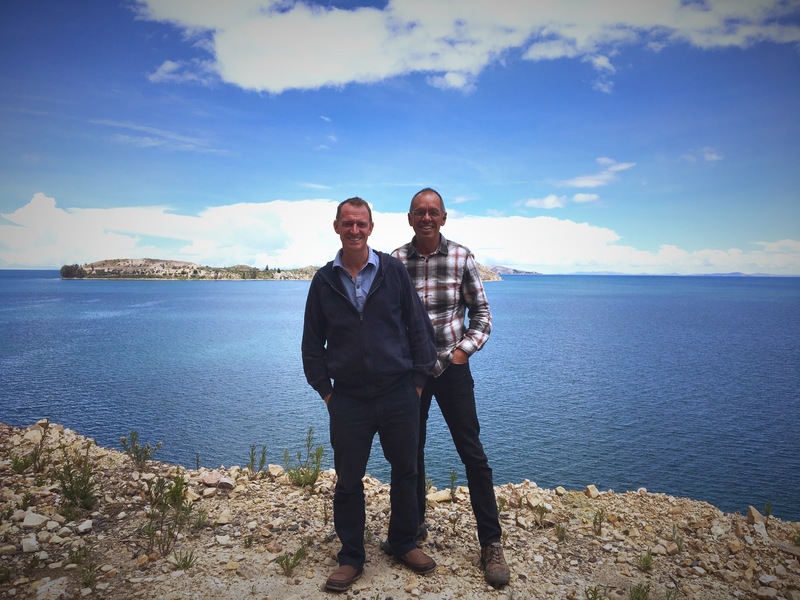 OK, now we’ve made it to Lake Titicaca. 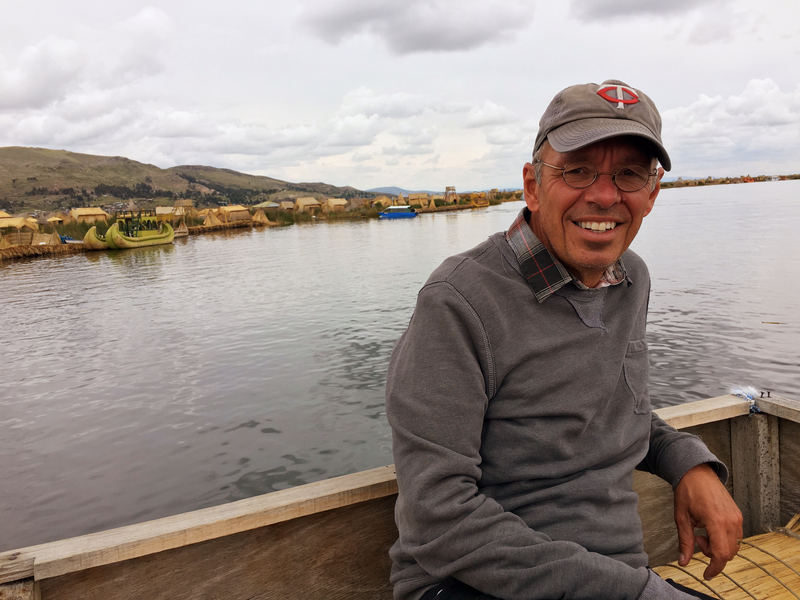 You’d never know it from Puno, but besides having such a fun name Titicaca has a lot going for it besides just forming part of the border between Peru and Bolivia. For one thing, it’s huge, about 3,100 square miles in surface area (about one-third the size of Lake Erie, to give that some context), making it the 18th largest lake in the world by surface area. 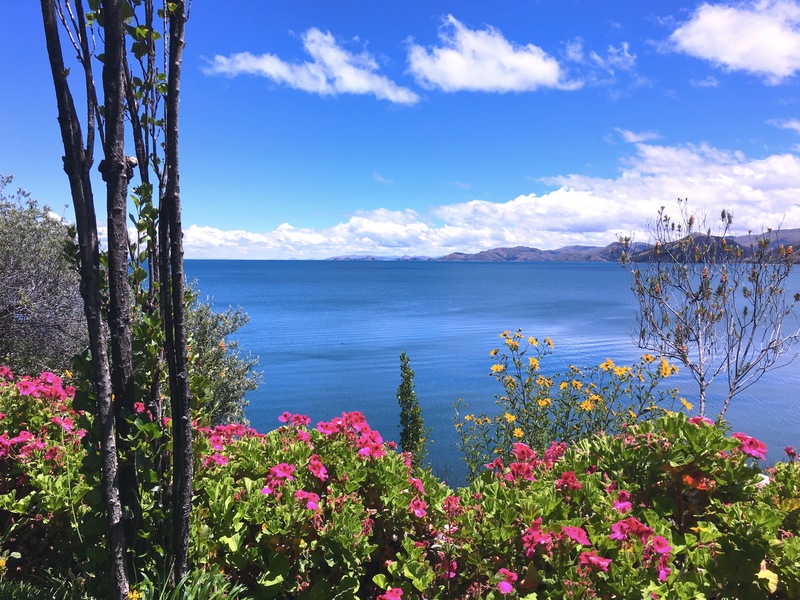 Measured by water volume, though, Titicaca is the 15th biggest lake and in fact has about twice as much volume as Lake Erie. So yeah, it’s big, and deep. On the way to the island we drove overland and then took this zodiac maybe 10 minutes. On the way back we were on a much bigger boat traversing the length of the island. This could be one definition of “navigable.” That’s me down there starting my kayak trip around the island. And it’s high, too. In fact at 12,500 feet above sea level it’s usually described as the highest navigable lake in the world. Now, “navigable” can mean a lot of things, but basically the 20 or so lakes that are higher are much smaller and shallower; if there are boats on them they’re just little fishing boats as opposed to commercial vehicles. 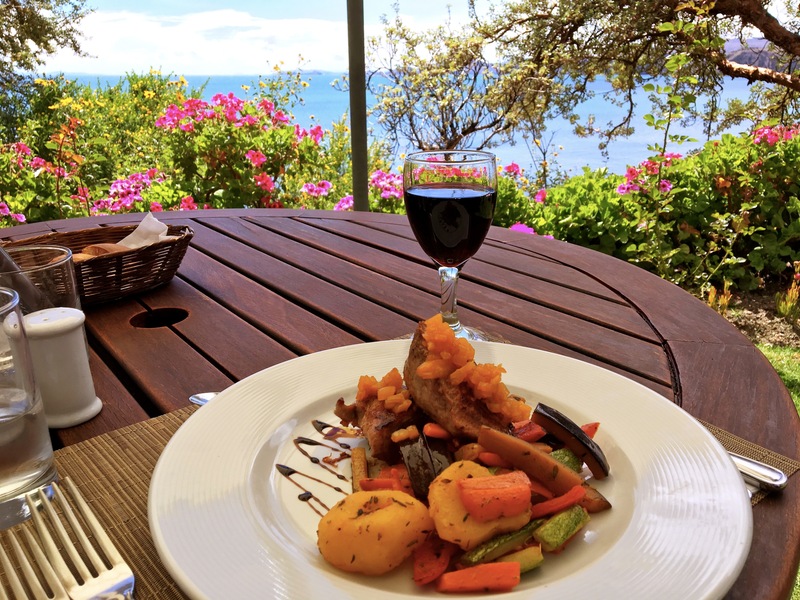 We wanted to get to know the lake a little and when we read on TripAdvisor about Isla Suasi, an island in the northwest corner of the lake that has just one hotel on it, we figured we’d hit the spot. 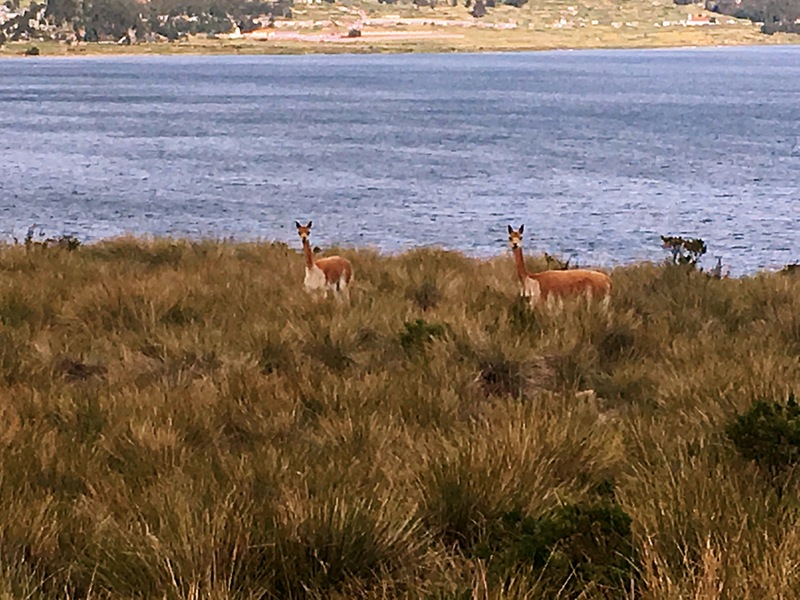 One hotel and a couple of out buildings, some hiking trails, a couple small herds of alpacas and vicuñas, and that’s all. All on about 110 acres. Every so often I like to get really away from it all, and this certainly fits the bill. To add to the isolation, the first and third days we were here we were the only guests. 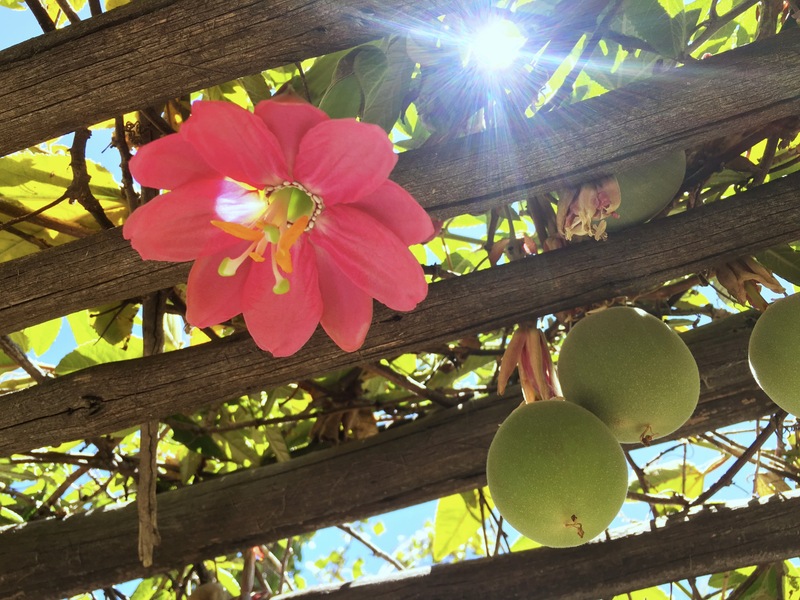 It’s kind of low season, though the weather has been just about perfect, sunny and low 60s. On our second day a group of 12 Italians and one Australian came, spent the evening, and left again late the next morning. Then Mark & I had it to ourselves again. Sweet! What do you do out on an island like this? Not much. We both read a bunch, played some games on our iPads. Didn’t surf the web, since there was effectively no Internet out here. Sure as hell didn’t watch TV; I only noticed shortly before we left that there are no TVs. 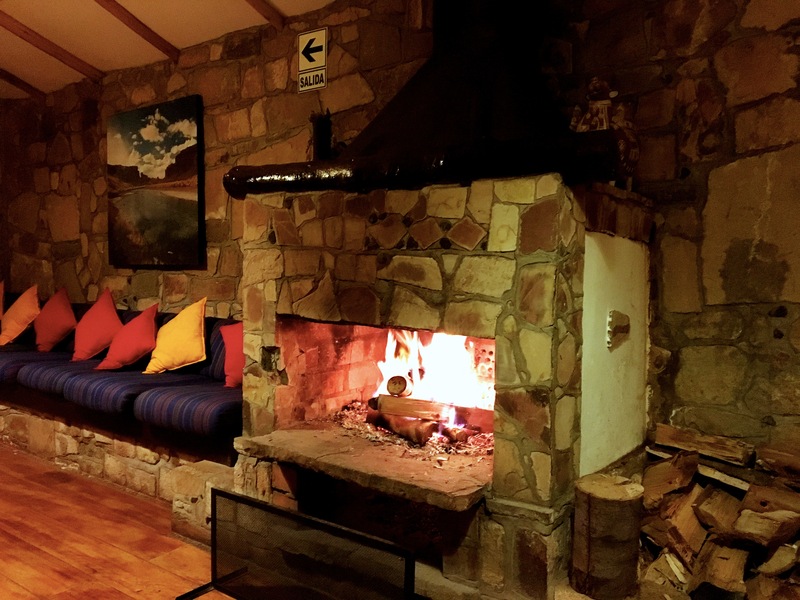 One night we were sitting in a public space in front of a beautiful fireplace and realized again we were the only guests in the hotel. So we got our portable stereo speakers, put them on top of the fireplace, and listened to fun music while sipping scotch and rum. That’s a good life! Mostly we just enjoyed the quiet and beauty. We were surprised how Mediterranean it looks: the gorgeous flowers, the brilliant blue water, the sky and the clouds. There was an easy 15-minute hike up to the high point on the island where you were supposed to watch the sunset, but by evening every day it had clouded over. 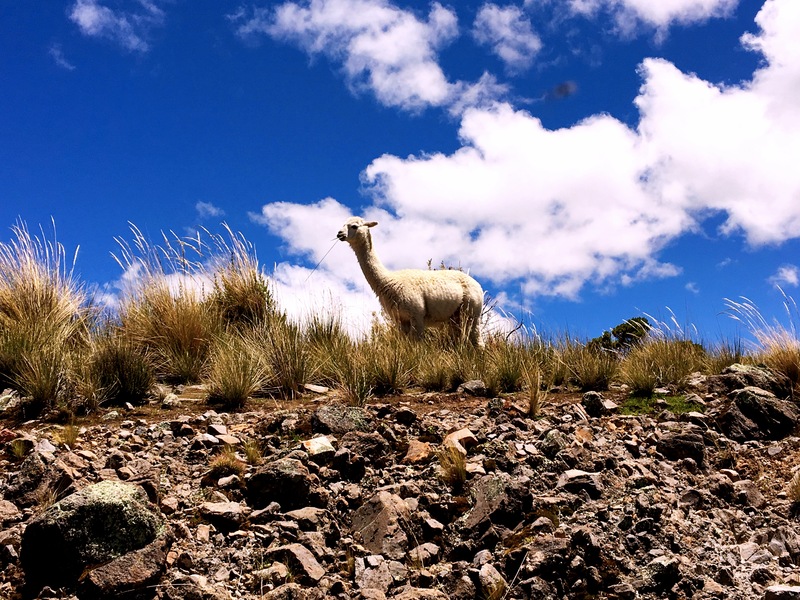 No problem; we still got to go out and watch the alpacas and vicuñas go about their business. I was ambitious enough to go out a couple times on their kayaks, once just exploring a bit and then later circumnavigating the island. All beautiful. And then there was the big challenge: do you swim? At 12,500 feet the water is pretty cold, but somehow I couldn’t not swim so after my second kayak trip I went in for maybe five, maybe even 10 minutes. The water is beautifully clear but definitely cold. I grew up right near Lake Superior and I won’t say Titicaca was colder, but it was on par. I wonder if or when I’ll ever swim at a higher altitude. The last part of our Isla Suasi journey was the three-hour boat ride back. It was a pretty nice affair; a comfortable boat with just the two of us, the driver, and a guide. No pretense of any safety demonstration or expectation that you’ll wear a life jacket, even when you’re up on top of the boat for the views and the sun. 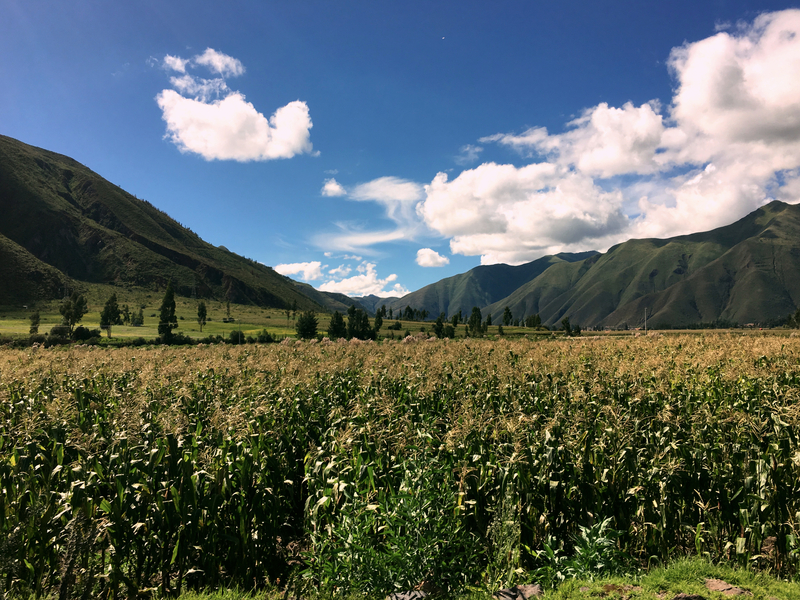 On the way back to Puno we stopped at Isla Taquile, an island with strong old traditions, beautiful handicrafts, and terraced fields dating back to the Incas. Of course we don’t buy handicrafts (or anything else except soap and toothpaste, which they weren’t selling), but it was still fun to learn a little about the people and see their remarkably isolated and unique lifestyles. We’d have loved to have hiked around the island, but that’s not the way these arranged tours work. 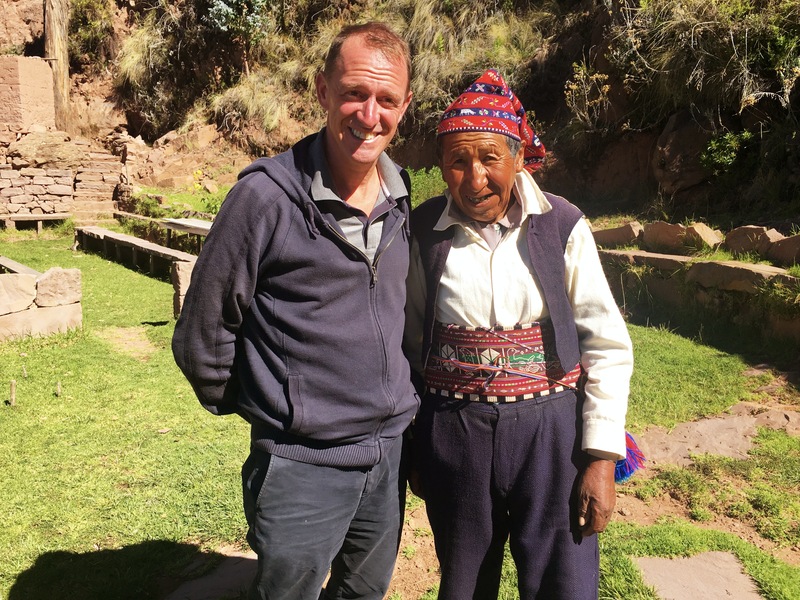 Mark with one of the old guys on Isla Taquile. The men here, our guide pointed out, knit their own hats as well as stuff for their wives. 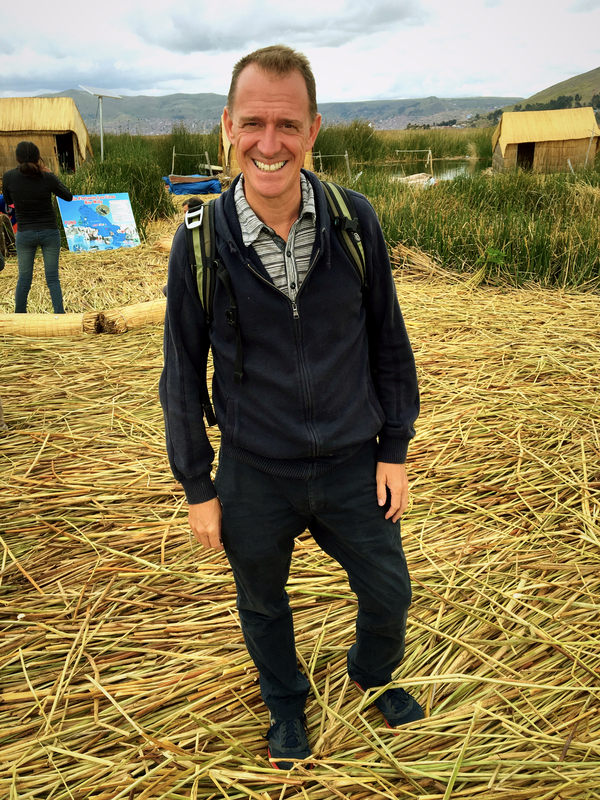 And then we stopped one more time at the floating islands near Puno. This experience was a little better than the first one since our guide could explain things to us a little more clearly. She explained how of course people in such a small setting and with such daunting physical challenges – building and maintaining floating islands out of reeds – have to work together. But what happens if people don’t work together? I mean, not everyone has such a cooperative bent, right? Sounds like a pretty great way to deal with unruly neighbors, eh? So that’s pretty much the end of Peru for us. 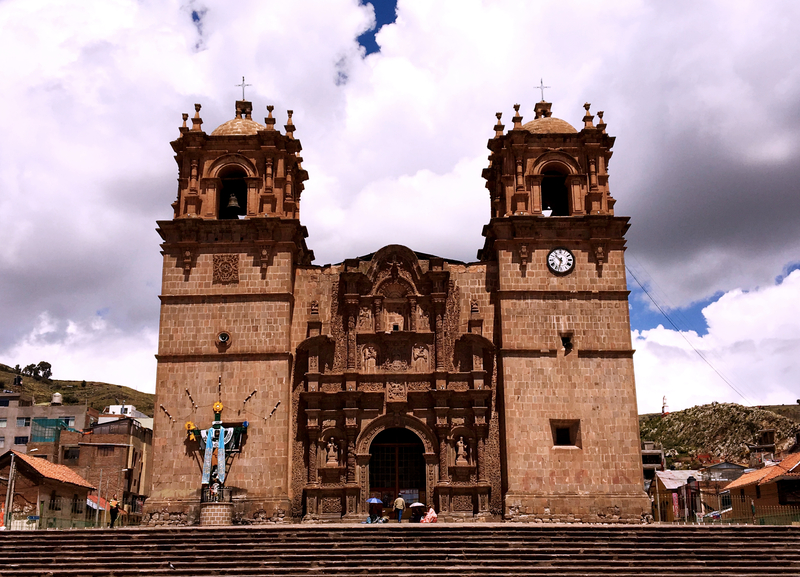 After spending a night back in Puno, we’ll take a bus on into Bolivia. 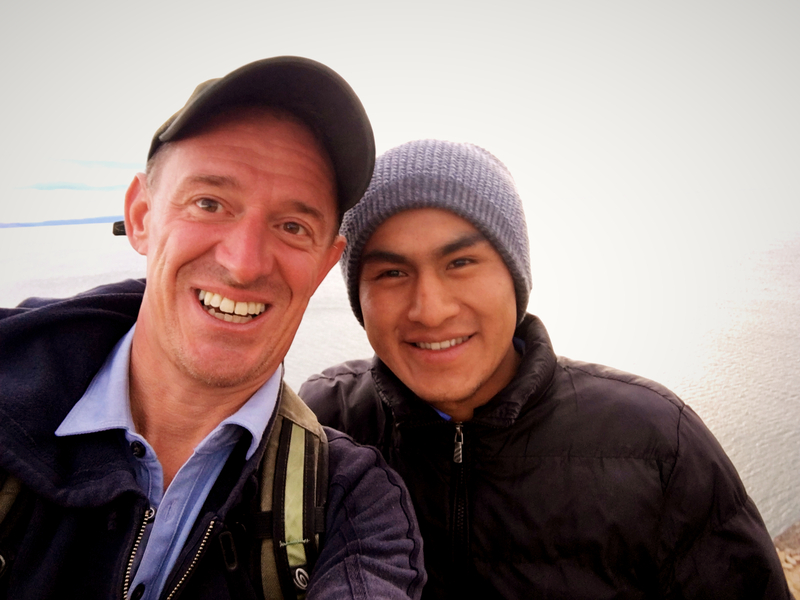 It was a great month exploring southern Peru! Our first afternoon on the island we hiked up to the highest point on the western edge to see the sunset. Alas, there was no sunset to see due to the clouds, but we did get this nice picture of Mark and our guide Videz. 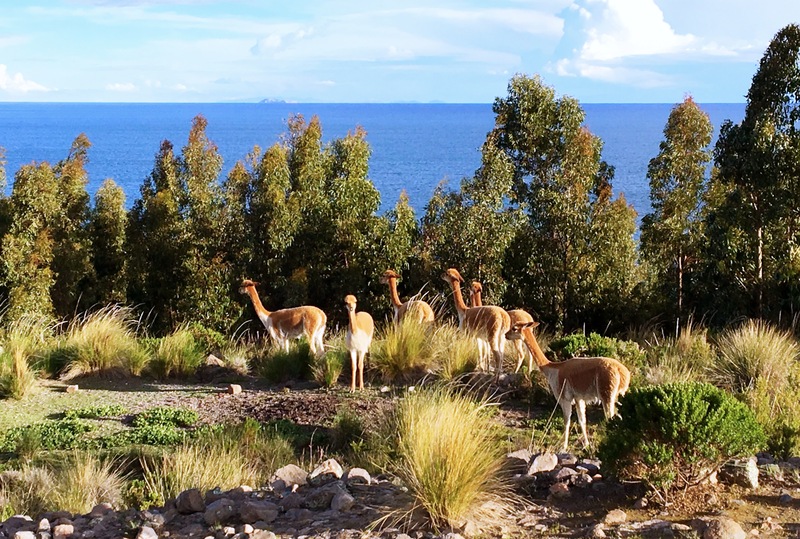 There were small herds of both alpacas and vicuñas on the island. 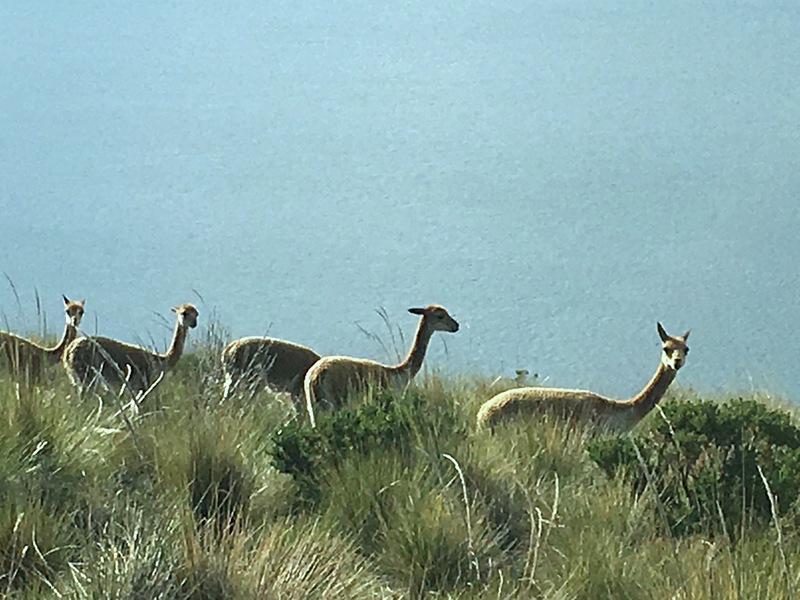 This was my first glimpse of the vicuña, an animal I found sleek, elegant, and gorgeous. All our meals were at the hotel’s restaurant. The food was mostly good, but this trout tartare was outstanding; we probably had it three or four different times. 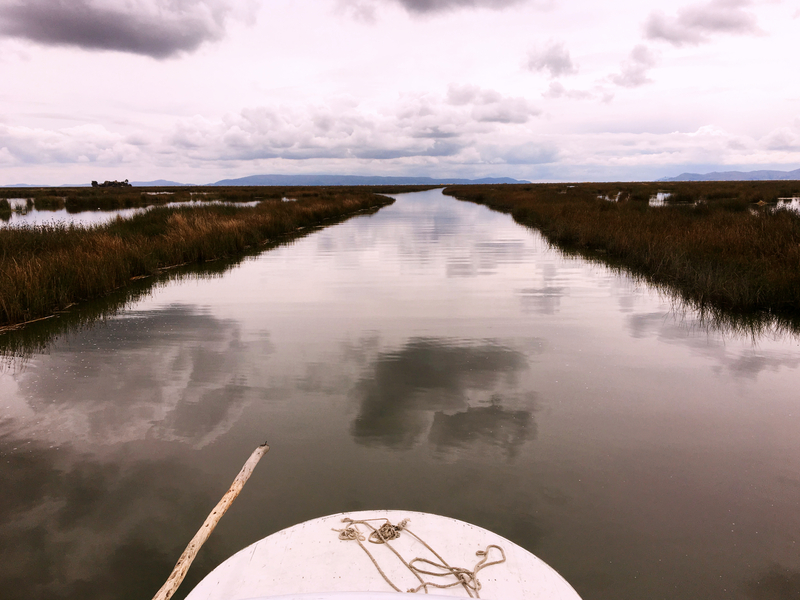 A view of Lake Titicaca from the top of our boat. It’s a big, beautiful lake. One of the many little floating islands. You can see over on the right side smallish blocks of … something. That’s the root stock that floats in the lake, on which they pile layer after layer of reeds. And it’s the root stock that they would saw off if they didn’t like someone on their island. Mark found a kitty on the island. According to Wikipedia, they keep cats to control the rat population. And how long do you think it took for Mark to make friends with said cat? There are easier ways of moving these big boats around than rowing them. Here you see a little motor boat providing the propulsion. The local women getting ready to greet our boat (and sell us trinkets). You can see the solar panels there generating electricity for them. As I looked at how small their houses are, it occurred to me that they might think we carry way too many clothes in our suitcases. 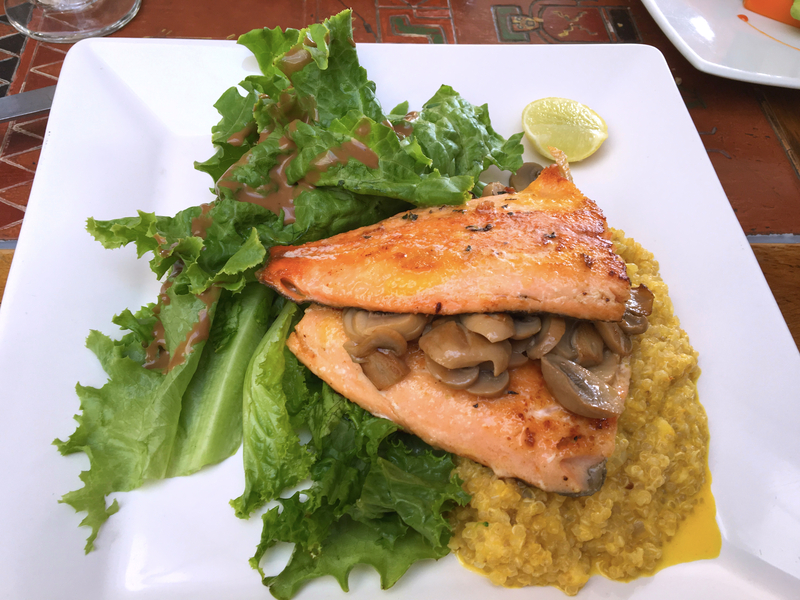 The food here wasn’t up to the Peruvian standards we’ve come to expect, but the local trout from the lake is pretty good. 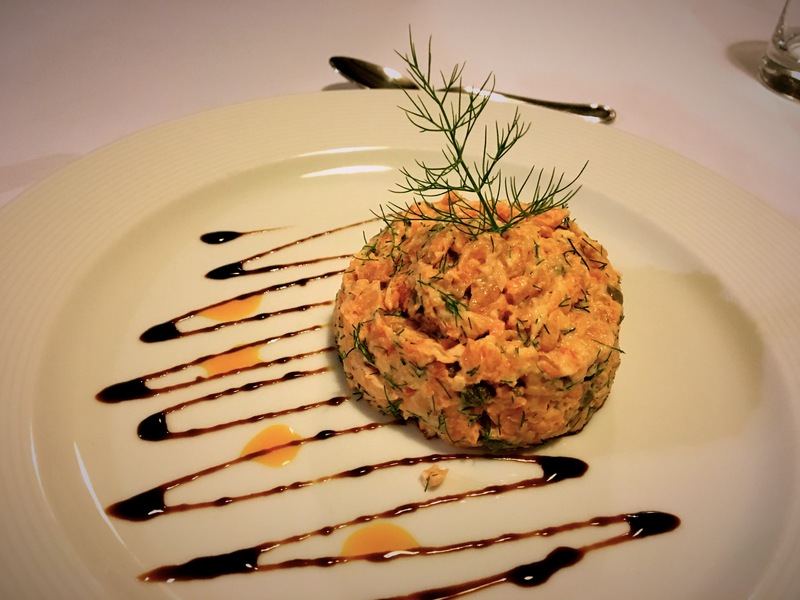 Here it’s served on a bed of quinoa, the nutritious and increasingly famous Andean grain. 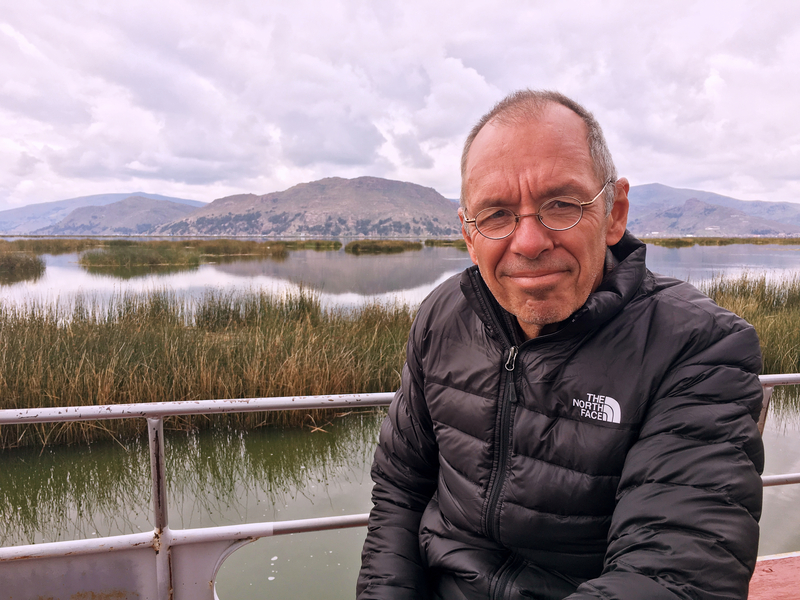 Well, we’re traveling between Cuzco and La Paz, and we want to see Lake Titicaca (in part because it’s just so much fun to say). So far, so good, makes sense to try Puno for a few days. Alas, though, my heart was left uncharmed. Part of the problem is that while the city of some 150,000 people sits right on the lake, you wouldn’t know it from the downtown area. 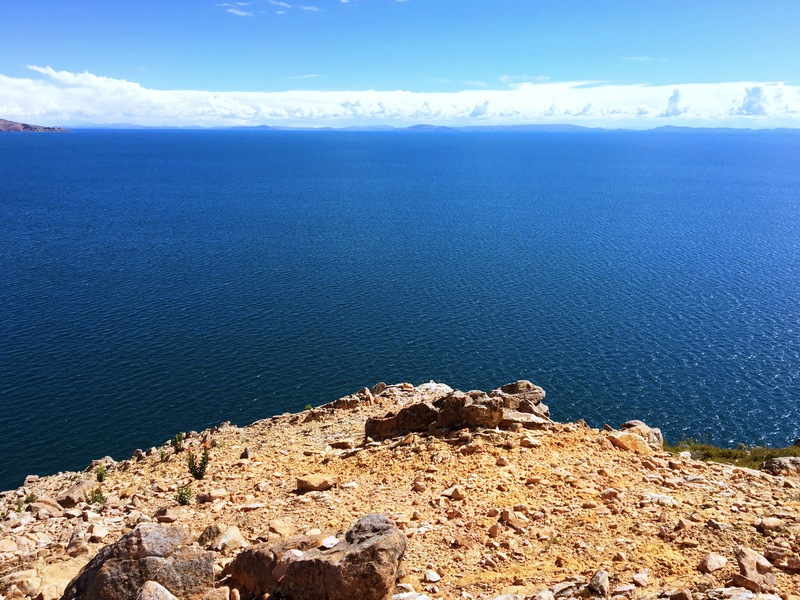 There is a port that we walked to, but even then all you see is a reedy area and the Bay of Puno, hemmed in by two peninsulas separating the bay from the big lake. 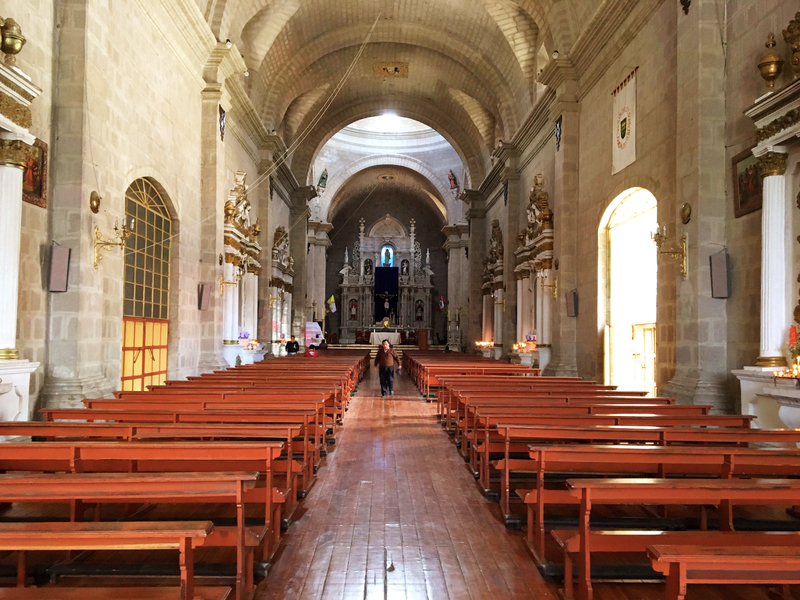 And the city just doesn’t have anywhere near the grand colonial architecture we’ve become used to from San Cristobal in Mexico, through Antigua in Guatemala, and Arequipa and Cuzco in Peru. Admittedly, those are some pretty high standards, but I guess our standards have gone up. 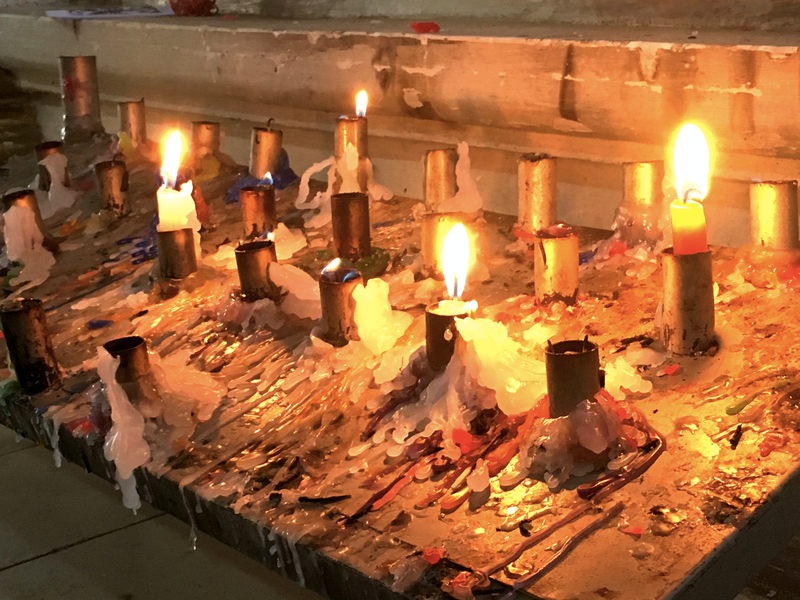 Interestingly, pretty much everyone describes “contraband” as one of the major industries in Puno. 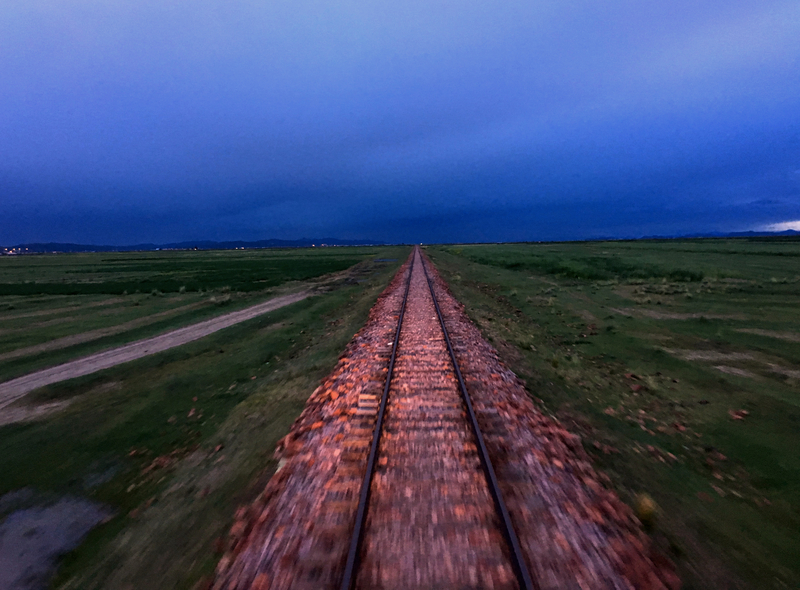 The proximity to Bolivia means that cheap tax-free goods are smuggled across the border and sold here. I never had the sense that those goods necessarily included drugs, but rather they were the more mundane goods that people use more regularly. Another problem with Puno is that Lonely Planet strongly recommends against one of the sites I’d have most liked to have seen. 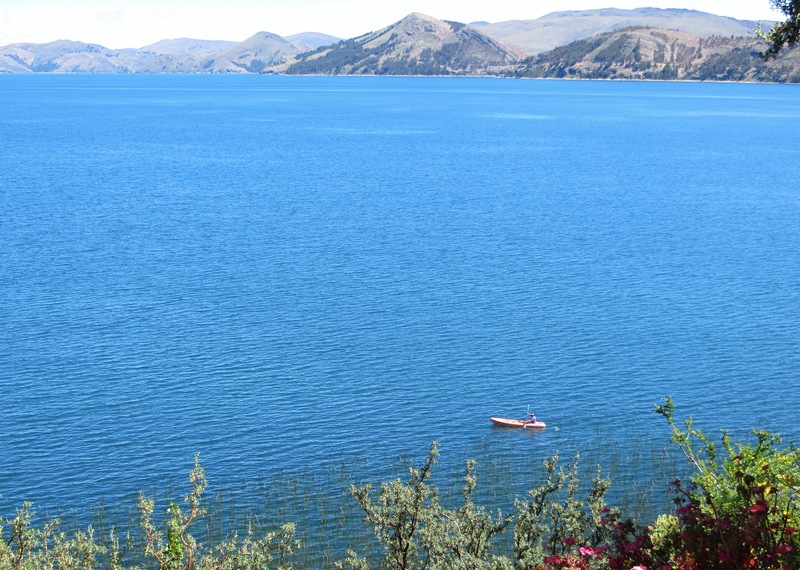 The city – sitting at about 12,500 feet above sea level – sits wedged between Lake Titikaka and the foothills leading up to Andean mountains. You’re supposed to be able to climb up a couple of the hills for spectacular views of the city and lake. 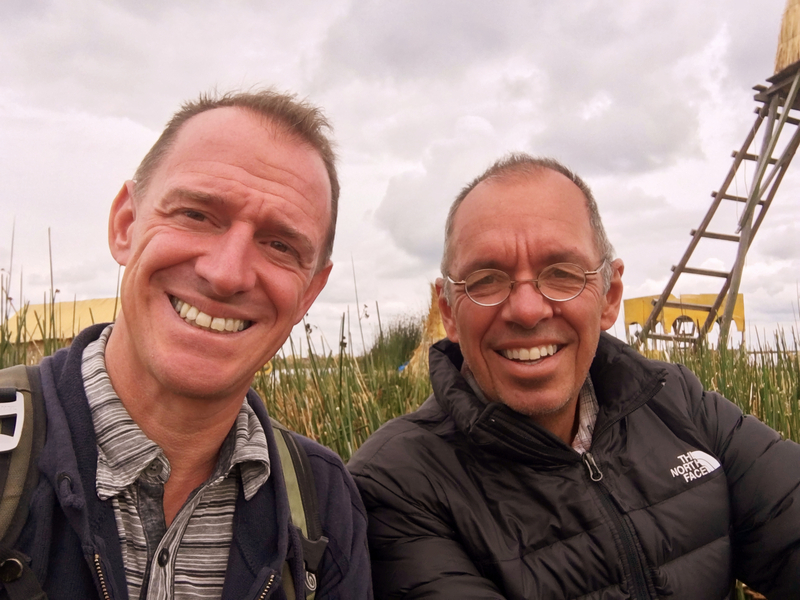 As Lonely Planet puts it, though, “… as assaults and robberies have been reported (even by groups), it’s not recommended to visit them unless there is a drastic improvement in security.” So we didn’t climb the hills. 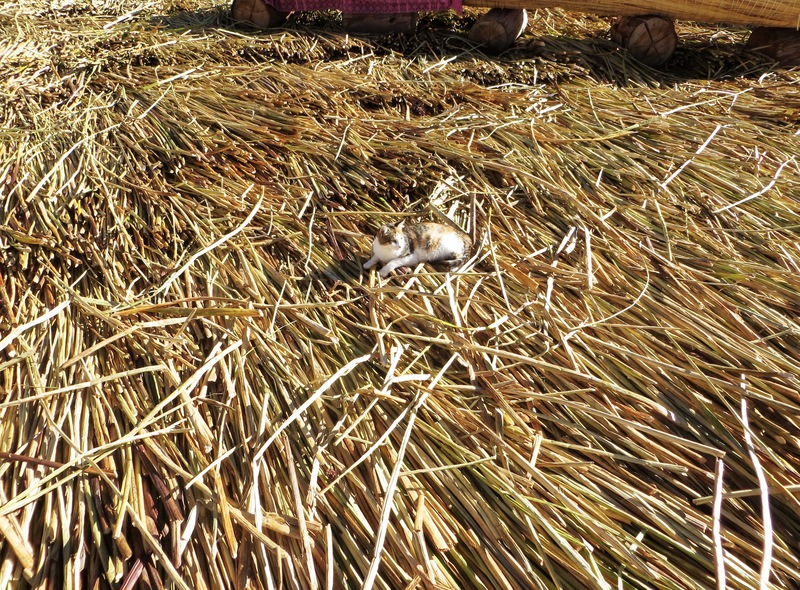 The one “must see” sight near Puno is the Islas Uros, the floating islands of the Uros people. 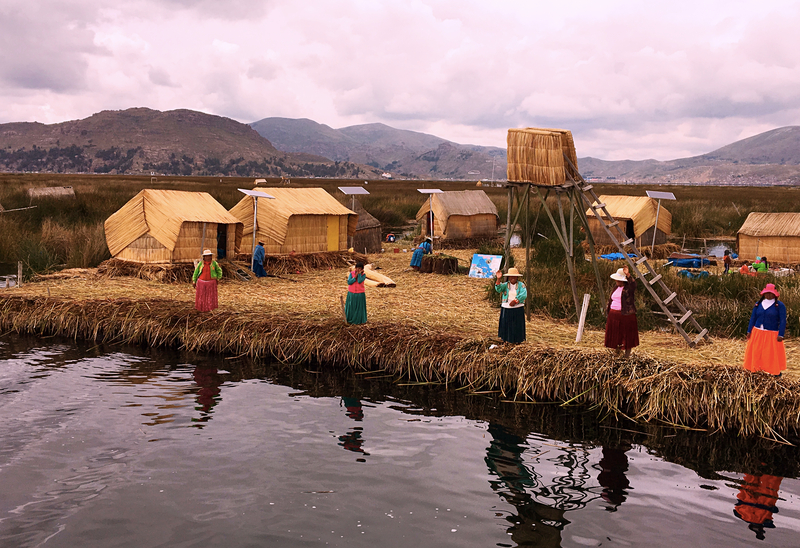 Back before the Spanish invasion, the Uros were under attack from the Incas. 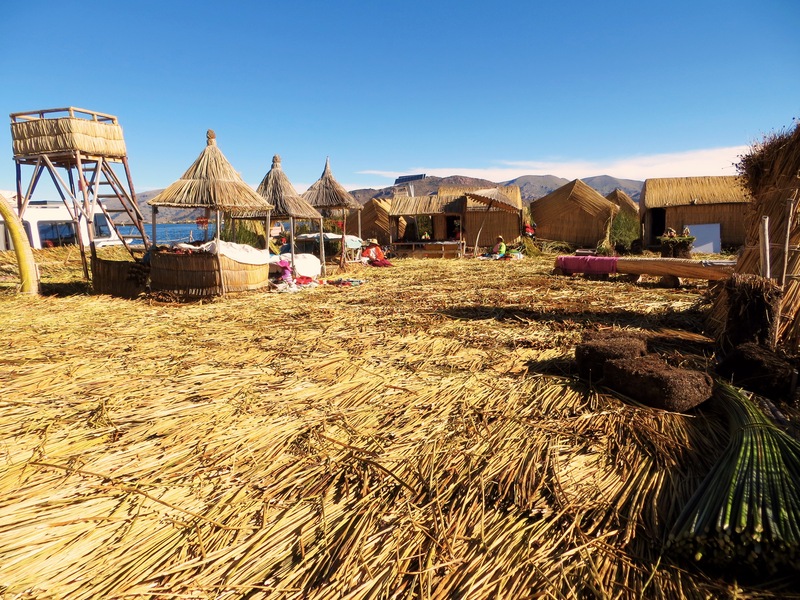 Discovering that the Incans couldn’t swim, they went a few kilometers out in the relatively shallow bay and started building floating islands made of the abundant totora reeds that grow in abundance in the lake. They cut a bunch down, lay them flat on a section of floating root stock, then lay another layer on top, and then another layer, and on and on until you can walk on it. Then they build houses on it. To keep them from floating away they’re anchored by tying the island to a stake driven into the lake bed. They build tiny “outhouse islands” near the larger islands, letting reeds, roots, and eventually the lake handle the waste. 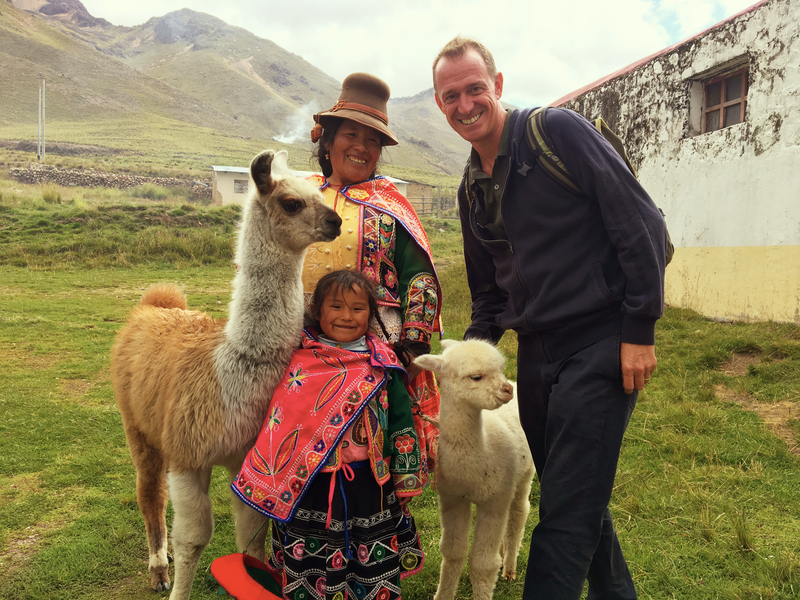 Live there while you fish and avoid the Incas and then eventually sell trinkets to fascinated tourists. And they’re still there today, perhaps 2,000 of them, hundreds of years later. 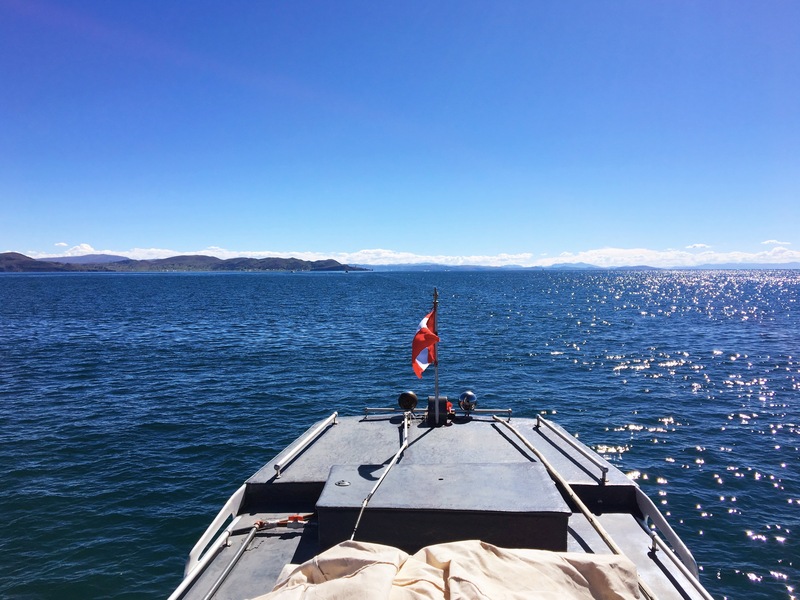 As we’re heading into the floating islands, you can see how little of Lake Titicaca we can actually see. And yes, those are the reeds out of which the islands a bit further out are built. So out we went. Just when you thought you’d seen all the bizarre ways of life the world has to offer, you stumble on one more. We thought we were avoiding a tour and just taking a ferry out there, but discovered that no, indeed we were trapped on a bit of an annoying tour. 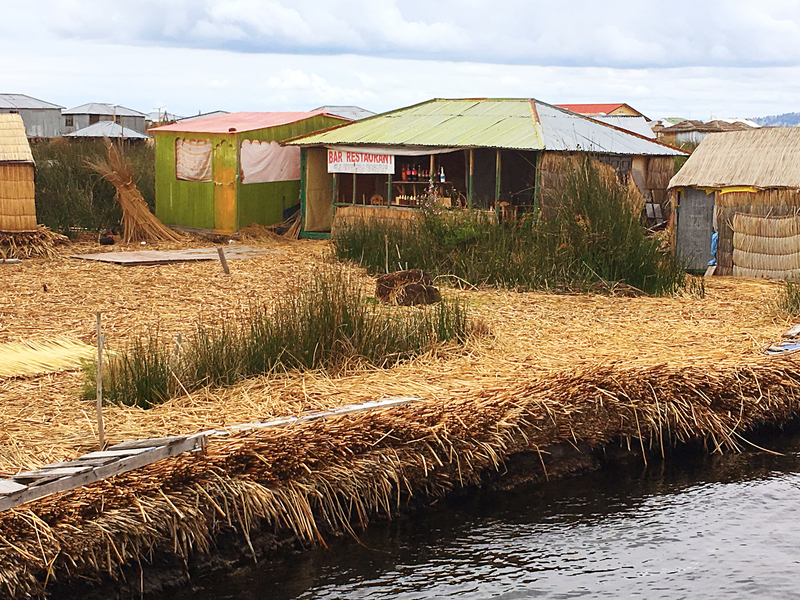 It was cool seeing people living on these floating islands and how the reeds serve for everything; the flooring, the houses, the boats, toys, you name it. They even eat them. We did stop in a little café for some tea, though they also served food, beer, and sodas. 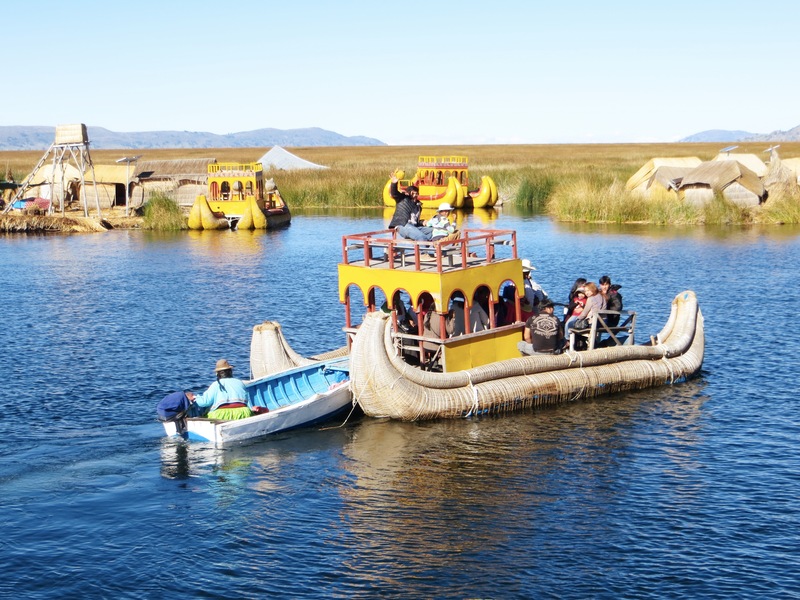 Just a bunch of people eking out their lives and avoiding the Incas on artificial islands on Lake Titicaca. After our first village visit they took us over to another one. Pretty much the same, except this one had a bar/café where we had a cup of tea. 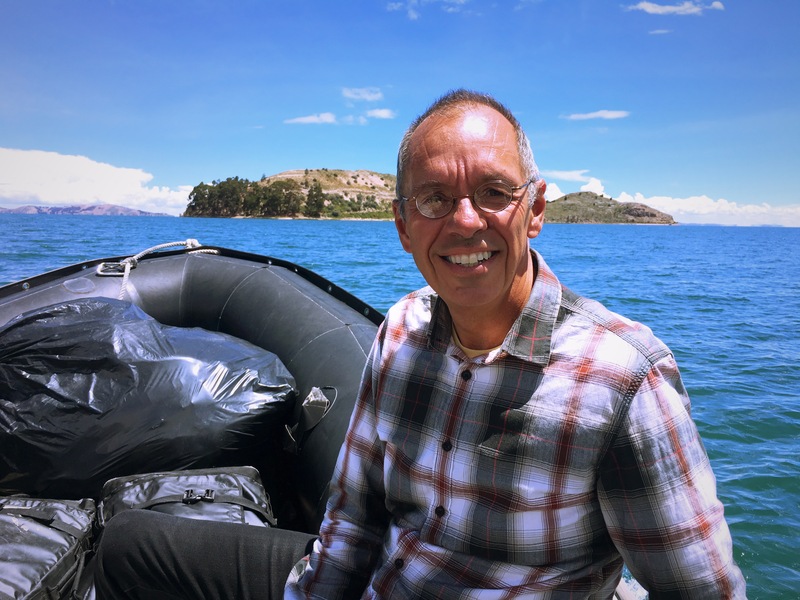 On an artificial floating island. Cool, but not really worth spending a couple days there. Fortunately we had a couple days, though, because my pinched nerve was acting up pretty significantly and I needed to go back to a clinic. The hotel recommended a tourist clinic nearby and at first I was pretty pessimistic. 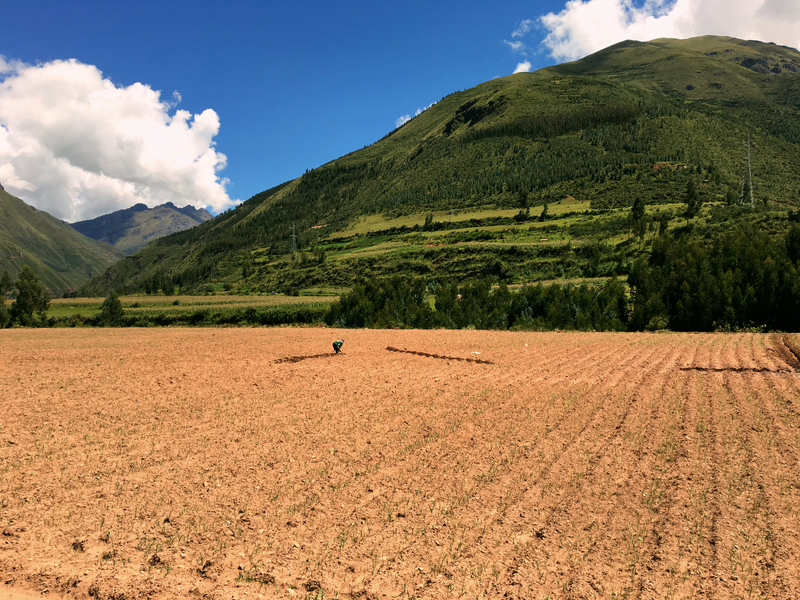 The doctor just didn’t seem to have anything more to offer than the three doctors I’d seen in Cuzco and it seemed all I was going to get was something to address inflammation. Near the end of our interview, though, he suggested maybe I should see a neurologist. Sure, I thought, but would I have to go to Lima or something to do that and schedule it weeks in advance? Oh, no, the doc told me; he could be here in 20 minutes. Not sure what that scowl was about, but here I am modeling my brand new coat. I’ve been traveling for almost three years without a warm coat but in Cuzco I finally broke down and got this North Face jacket. And I love it! Sitting up on the top of the boat as we’re heading back to the mainland. I love traveling in places where there’s not even any pretense of suggesting you’d want to wear a life jacket. So he gives me some pills to take morning and night for three days and then a different set of pills for the next 10 days. At first it was like a miracle; after a few hours all the pain was gone. Since then it’s come back in modest doses, but nothing like the first two weeks and seemingly fading away. I’m in love with that little neurologist. 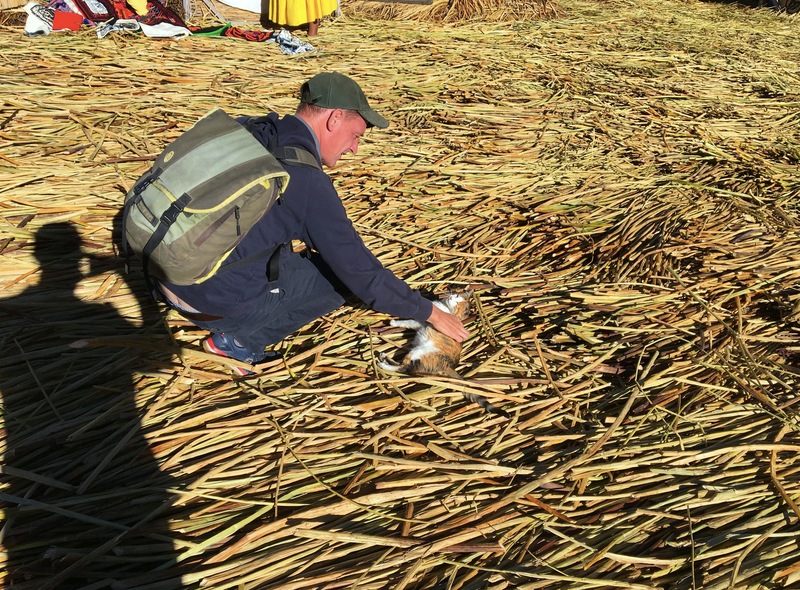 For Lake Titicaca and the floating islands, then, Puno was sort of meh. For visiting with a gnomish neurologist, though, it was a big success. 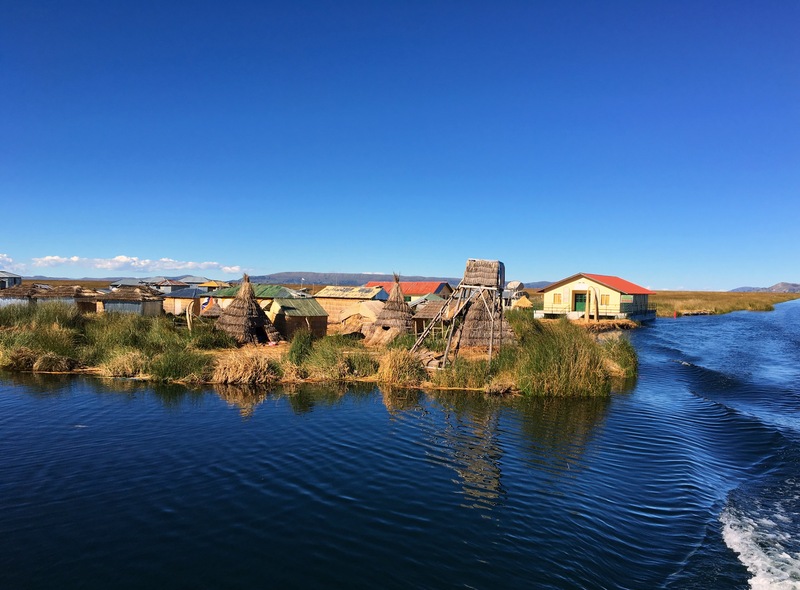 We’re trying to get a full Titicaca experience, so next stop is a small island in the northeast section of the lake. Mark standing on the reeds. Every month they bring a new batch for the top, as those on the bottom rot away. And they’ve been doing that for several hundred years! More grilled trout, this time on grilled vegetables. Apparently the indigenous trout are too small to be useful, so they’ve stocked the lake with Canadian trout which are much bigger and tastier. 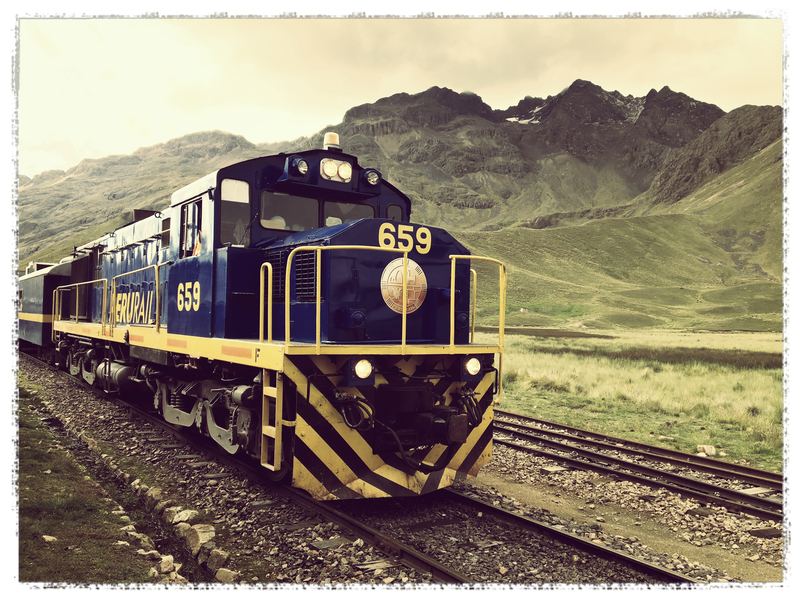 The Andean Explorer, stopped at La Raya Pass, over 14,000 feet above sea level. I loved editing this picture to give it an olde fashioned look. From Urubamba we were heading down to Lake Titikaka on the border with Bolivia. What’s the best way to go? 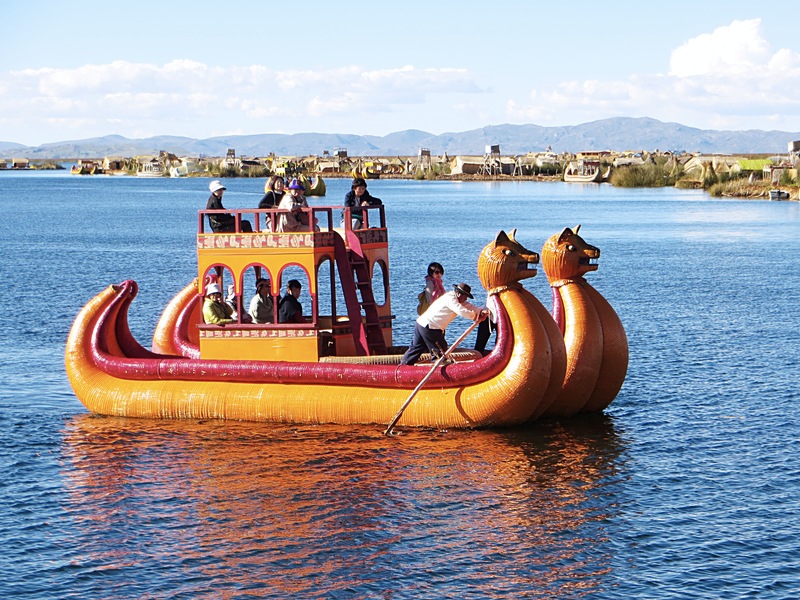 Well, you could take a bus, a long bus to Puno, the major Peruvian city on the lake. 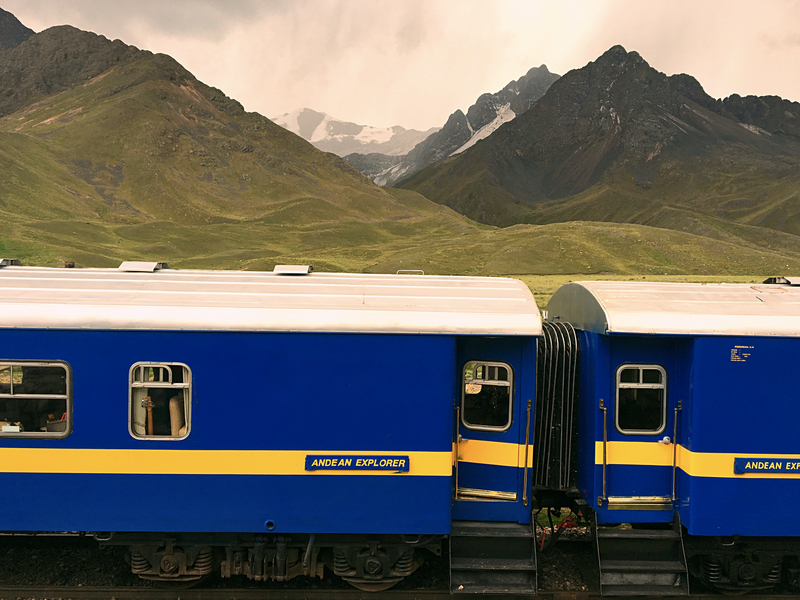 Or, if you want to splurge, you could take the Andean Explorer, a luxury train that crosses through amazing scenery across the Andes down to Lake Titikaka. So we went with the Andean Explorer. 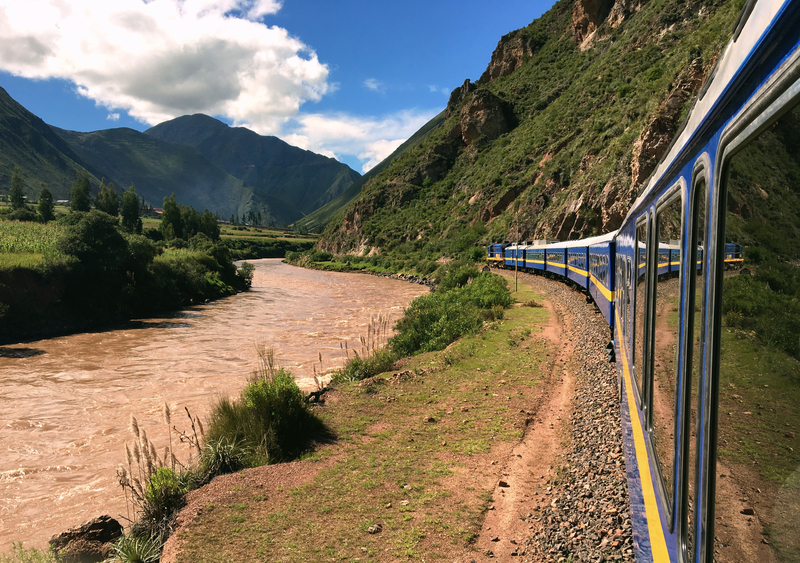 Back in the day, before they had paved the highway to Puno, the train was the only realistic option for getting from Cuzco to the lake. Today the highway is paved and buses are an entirely reasonable option if you’re willing to sit on a bus for eight or nine hours; they even follow pretty much the same route, so you see the same scenery. 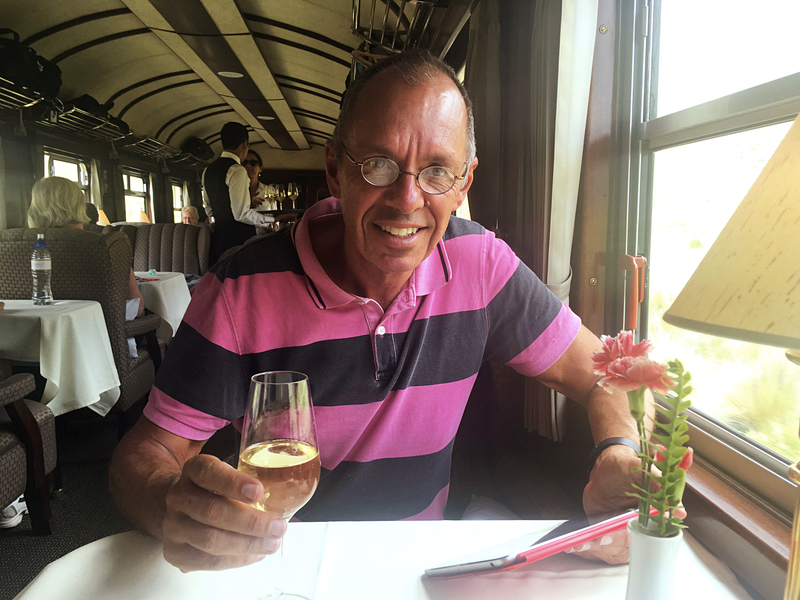 The train, though, is a way to see Andean Peru in style, in comfortable wing-back chairs, with table cloths, wine, pisco sours, a nice lunch, great tea service, a bar, and semi-open observation car. It genuinely feels like a throwback to the glories of the late 19th century plus internet access so you can keep tabs on how the stock market is doing. We loved it. We’d done something similar in Switzerland, when we took the Glacier Express from Zermatt to St. Moritz. 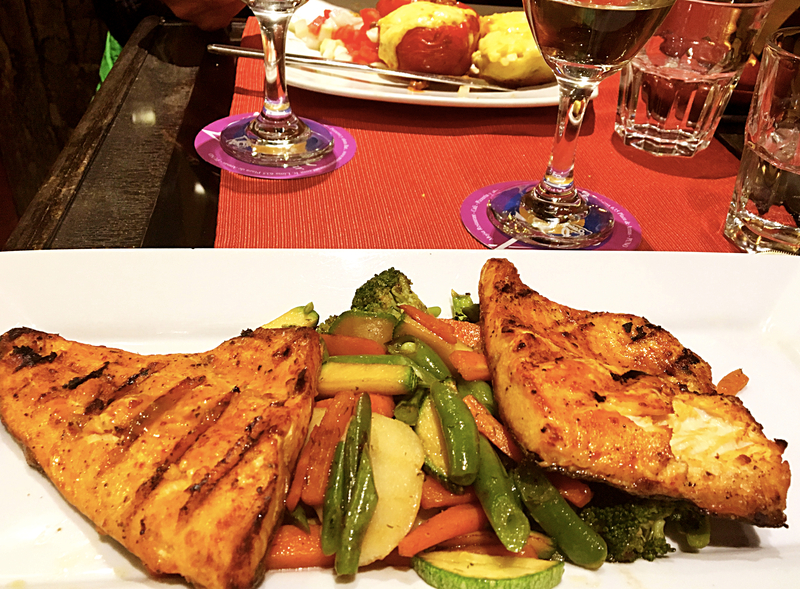 We both thought this was significantly better; better food, better service, more comfortable, maybe even better scenery (though the Swiss Alps aren’t exactly boring). It’s a ten-and-a-half hour journey, so doing it in style and class makes for a pretty fabulous day. 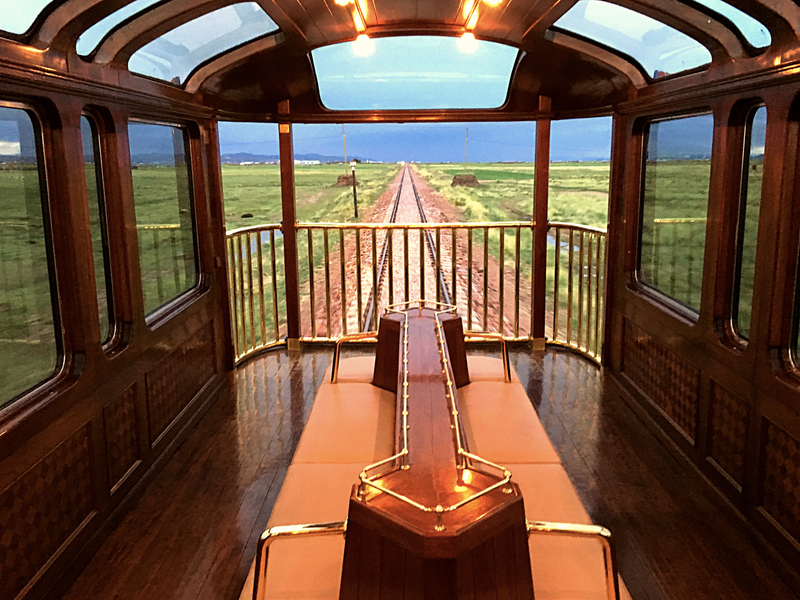 To give you a sense of “style,” I learned while reading up on the route that the car interiors were designed by the same firm that designed Singapore Airlines’ First Class cabins, generally conceded to be the best in the business. 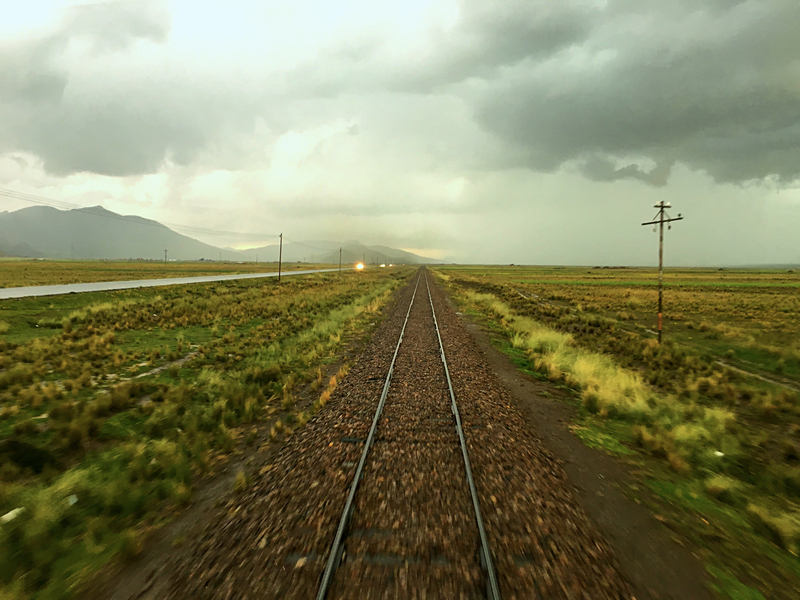 You’d sit, maybe read a little, look out the windows, watch the mountains go by. Our car was almost entirely an Australian tour group with a guide Mark & I loved talking to. The only non-Australians in the group was an American couple from Oregon who won’t travel with American tours for fear they’ll have to deal with Republican.s Gotta love them! One of the highlights was stopping at La Raya Pass, the high point of the trip at 14,150 feet above sea level. We think that’s the highest either of us have ever been, and it definitely had the feel of just a remarkable and remarkably remote place on earth. 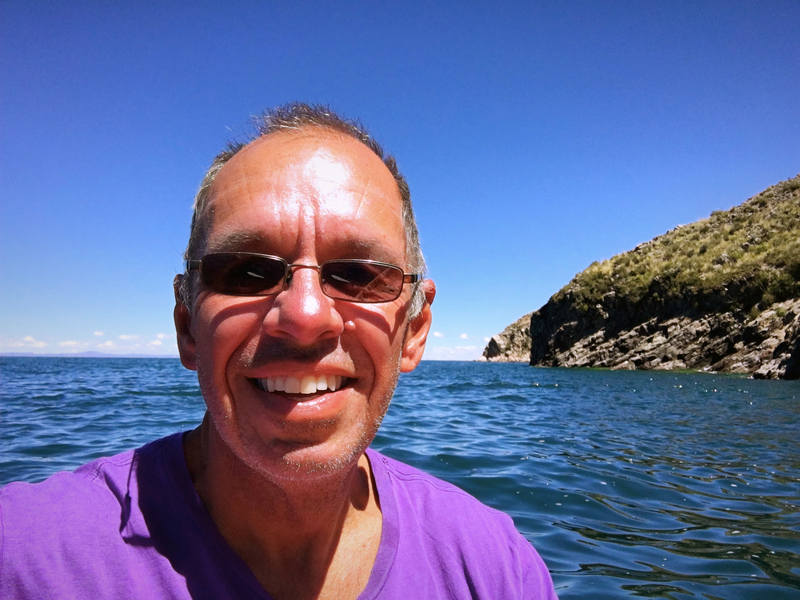 From there we descended to Puno, still over 12,000 feet, on our way to explore Lake Titikaka and then move on to Bolivia. While you’re way up in the mountains there are still people living and working up there. I wanted to capture the isolation of this lone guy (woman?) out in the field and this seemed to do the trick. There’s a small market up at the pass with locals selling little homemade souvenirs. We don’t buy things, but I was willing to pay $2 for this cute picture.